Alas, on immigration the President keeps preaching to the converted. 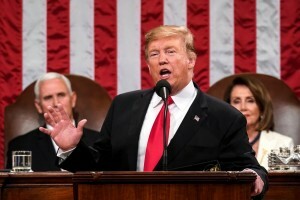 President Trump used his State of the Union address Tuesday to highlight his achievements and make a pitch for bipartisan cooperation in Congress. Overall it was an effective piece of political rhetoric, especially his defense of his tax and deregulation policies and their results. But we doubt he reframed the political debate in a way that will give Democrats much pause going forward this year. The biggest disappointment was his failure to reframe the immigration debate. He faces another government shutdown deadline at the end of next week over funding for the border. Yet he merely repeated his familiar parade of horribles about the border, the caravans moving north, and illegal immigrants who commit crimes. He is preaching to the converted and persuading no one else. Mr. Trump sounded like someone who expects no compromise on immigration and thinks it will remain a stalemate through the next election. Mr. Trump made bipartisan offers to Democrats on some of their priorities—controlling drug prices, public works, family leave. But the divide on details between the two parties is so large on these issues that they are unlikely to become law. That’s just as well because anything that could pass this Democratic House is likely to do more harm to businesses than good for consumers and workers.